During the second quarter, Imagineer conducted our 2018 Annual Investor Relations Survey*. The survey aims to help the community of IR professionals to share insights and best practices along with their collective vision for where the investor relations function is heading in the future. No matter the size of the team or assets under management, every manager we spoke with is facing similar challenges. Unsurprisingly, fundraising is clearly a top priority and constant challenge for all but the largest of managers. Aside from the struggle to raise and retain assets, nearly every manager cited brand-building, investor communication, time and data management, and human capital resource constraints as top of mind and crucial to future success. Other challenges faced by investor relations teams we surveyed include poor alignment between internal departments, issues with communication and coordination with fund administrators, and the blurring lines between traditional and alternative asset management. At asset management ﬁrms today, the investor relations role can include both fund marketing and investor relations, especially smaller ﬁrms. At larger ﬁrms at the other end of the spectrum, the investor relations role can be highly specialized across geographic boundaries, investor types, and investment strategies. Regardless of the size of the ﬁrm, one recurring macro theme from the survey is that clearly deﬁning and executing an investor relations strategy to drive daily activities has become increasingly important to the success of asset managers. A clear, proactive strategy for managing relationships and communicating with the target market is key to driving success with clients. During what has been a difﬁcult multi-year period for the vast majority of hedge fund strategies, savvy investor relations teams suggest they have invested in strategy as a way to differentiate themselves, build brand equity, and become more effective at communicating. The result: these managers have been able to continue to attract and retain assets. This hasn’t been an easy task, due in part to an ever-changing and increasingly complicated operating environment which has been fueled by the demands of investors on the one hand and regulators on the other. Despite their recognition of the importance of strategy, however, many managers report that they are struggling to formalize a proactive investor relations strategy. More than 20% of survey respondents indicated they have yet to deﬁne a strategy clearly. These managers indicated they consider their approach to investor relations to be entirely reactive. Many of these respondents noted they are experiencing challenges related to a “lack of management support,” or “too few resources, like budget, time and staff members,” which they believe are holding them back. Thoughtfully deﬁning and executing an investor relations strategy takes time and support from the top down to be effective. Securing buy-in from senior management to evaluate the role of investor relations in the growth and development of their ﬁrm is an essential step for managers of all shapes and sizes. with who have experienced signiﬁcant growth over the last few years stated their belief that one of the key reasons they were successful early on was precisely because they had a strategy in place from day one for communicating with and servicing clients. Investor relations teams should coordinate their efforts around a clear strategy for the same reasons a portfolio manager hires a team of analysts to focus on opportunities that fall squarely within the fund’s investment objectives. First and foremost, ensuring everyone is marching to the same beat helps to align behavior. 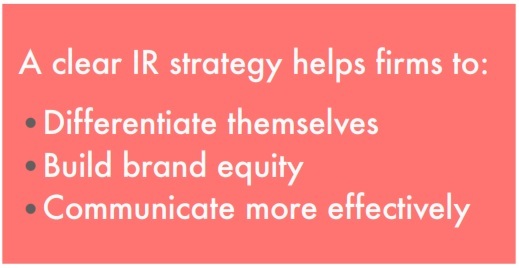 What’s more, when the ﬁrm’s investor relations strategy can be easily communicated and articulated across the ﬁrm, it is more likely to be internalized by everyone on the IR team – and across every other department, too. When the strategy is internalized, teammates will use it as a guide for their individual choices and more effectively set priorities that reinforce the manager’s overarching objectives. In the end, this can help the investor relations team to be more effective. Achieving clarity around investor relations strategy can also lead to improvements in other areas, such as the ﬁrm’s ability to more clearly articulate its value proposition to investors. inhibits their ability to stay ahead of competitors running similar strategies in the same asset class as it relates to gathering and retaining assets. The competition for investor capital is more ﬁerce than ever, and with more funds and hybrid products in the market, articulating one’s value proposition is key to differentiation. Many investor relations teams report they are drumming up new initiatives to foster better relationships with existing investors. In fact, increasing the satisfaction level of all clients has become a priority for many managers, especially the largest ones. Other strategy differentiators include the use of special-purpose investor conferences. Some ﬁrms are utilizing investor days as a chance to bring all their clients together under one roof to talk about the ﬁrm, clarify their investment strategy, share ideas, and speak about what the future holds. Some managers have been able to attract a signiﬁcant number of investors to these events by lining up keynote speakers and marketing the event as a unique networking opportunity for their investors. Another tactic some respondents are beginning to adopt is to establish themselves as a thought leader in a particular strategy or market segment. Many of these organizations are providing additional reporting, market research, and commentary on various market segments to increase engagement among their investors and attract more attention. By sharing thought-leadership research exclusively with investors and prospects, many ﬁrms are adding signiﬁcant value-add to their ﬁrm’s value proposition. Additionally, 33% of respondents have established the practice of conducting periodic investor interviews as part of their relationship management process. Many are conducting these interviews to gain insight into what their clients perceive they do well, which helps them continuously reﬁne their value proposition. Conducting investor reviews also helps them to obtain critical feedback on what areas they can improve. Collecting and responding to positive and negative feedback is necessary for investor relations teams to strengthen areas of the overarching business that need improvement. Investor interviews also give managers the opportunity to learn what their investors think about the current state of the markets, what types of products they are in need of, and what their outlook is for the future. Over the next few years, the industry should expect to see an uptick in the adoption of investor reviews by more managers of all sizes. Perhaps the most widely used technologies in investor relations – aside from email and the telephone – are CRMs and web portals. In fact, 63% of respondents indicated their investor relations practice is organized around the use of one or both of these tools. While 10% of respondents mentioned they use a generic CRM product, the majority of managers are leveraging industry-speciﬁc platforms, like Clienteer. Some respondents stated that some of the advantages of using an industry-tailored CRM are that they allow them to streamline many important processes such as distributing account and fund level reporting, and monitor subscriptions and redemptions transaction histories by utilizing balance and transaction import tools that are tailored to datasets provided by fund administrators. What’s more, respondents indicated their expectations for improvements and feature enhancements to industry-speciﬁc CRMs to help them leverage automation, AI, and machine learning to help them improve their processes. Many respondents also utilize an investor portal to communicate with their clients. Many ﬁrms utilize the portals offered by their fund administrator or other generic document sharing platforms to share information with their clients. Other managers use branded portals that enable investor relations teams to push prospective and current investors to an extension of their website where they can securely consume information like performance numbers and various reports. Some teams are even taking this a step further by posting videos and market commentary for their clients and prospects to access. information and reporting. Perhaps more importantly, some also argue that using their own branded web-portal helps them to control messaging and sell the value of their brand more effectively. Many managers long for a time when most, if not all of their interactions with clients can be about the portfolio or the future of the business relationship, instead of working to ﬁgure out the cause of a discrepancy in an account statement or tracking down a document from a three-year-old email exchange. The primary beneﬁt that managers accrue from taking advantage of technological improvements is more free time to nurture relationships with clients. Every interaction with a client is an opportunity to strengthen the bond and improve the health of the relationship. 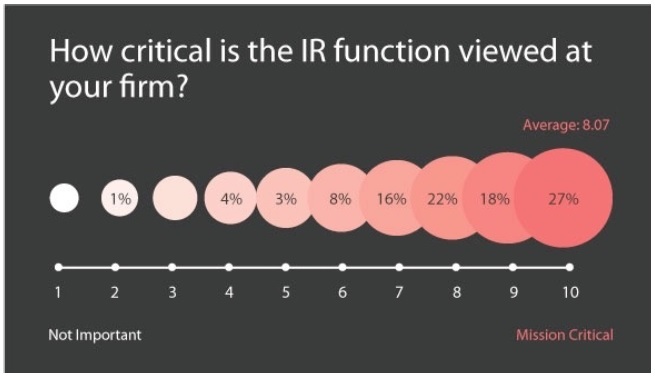 Finally, and to close on a positive note, the majority of IR teams feel their role is given the attention it deserves by their organizations. In years past, this hasn’t always been the case in our surveys. To find out more about Imagineer Technology Group go to itgny.com. To read the survey sections on the future evolution of i.r. 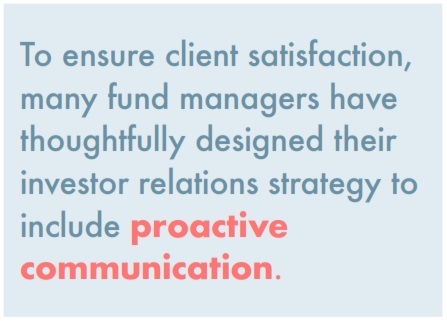 and proactive communication, you can download the whole at survey at https://learn.imagineercrm.com/2018-investor-relations-survey-report. * The survey, conducted over a period of two months, presents the views of investor relations professionals of all experience levels at more than 100 hedge funds, private equity, and traditional asset management ﬁrms ranging in assets under management (AUM) from under $250 million to more than $30 billion. We made a point of engaging ﬁrms of all shapes and sizes for the 2018 Investor Relations Survey to get the most balanced look at the function we could. More than 40% of survey respondents were from ﬁrms managing more than $1 billion while nearly 30% hail from young or growth-stage organizations with $250 million or less. The other 30% make up the middle: ﬁrms with $250 million to $1 billion in assets under management.